Pandit Govind Ballabh Pant is a prominent name in the Indian history. He was an Indian freedom fighter, who also played a role in shaping modern India. Where would we be without the great freedom fighters? 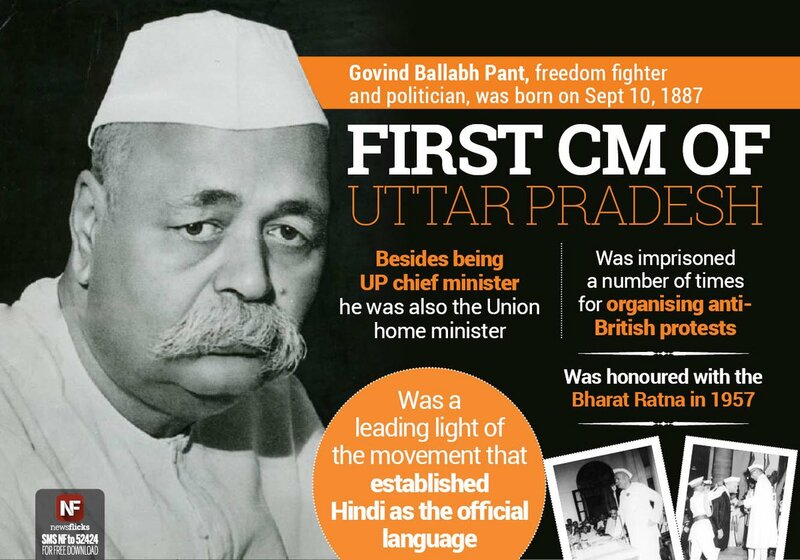 Govind Ballabh Pant was born in Khoont, Uttarakhand, in the year 1887 on September 10. He died on 7th March in the year 1961. You will find many educational institutions and hospitals that bear his name. His name has gone down the Indian history and little children read about him in their textbooks. He struggled for India’s freedom and later, he became an asset for the Indian Government. Govind Ballabh Pant is the son of Govindi and Manorath Pant. However, it was his grandfather, who took care of little Govind. He belongs to a small village called Khoont in Uttarakhand. The village is near Almora. Little did the boy from Khoont village know that he would become a great political leader! His father was a Government Official and so, he had to constantly move from one place to another. Govind spent little time with his parents and it was his maternal grandfather, Badri Dutt Joshi who helped in shaping the political and world views of the young boy. Badri Dutt Joshi was also a Government Official. He had a son, who was also a politician. Krishna Chandra Pant was his only son. His son died in the year 2012, leaving behind two sons and a wife. Govind Ballabh Pant started as a lawyer in Kashipur. In the year 1914, he joined the Indian independence movement. He entered the political scene in the year 1921. He was an unstoppable soul, who was passionate and serious about politics. It was him, who organized the salt march in 1930. He got arrested and was imprisoned as well. The British Government imprisoned him but he still had the fire inside him. In the year 1921, he was elected as the Legislative Assembly member of the United Provinces of Agra and Oudh. He also became the leader of the reputed Congress party in the assembly. He was an excellent lawyer and his skills won the hearts of the Congress. Govind Ballabh Pant got arrested many times for organizing movements. He organized the Satyagraha Movement and the famous Salt March. In 1940, he was arrested for organizing Satyagraha Movement. He got arrested again in the year 1942 for signing the Quit India resolution. It was Jawaharlal Nehru, who pleaded for the release of G.B. Pant. Most of the years of his life were spent in struggling for India’s independence. He would never give up. He was the First Chief Minister of Uttar Pradesh from the year 1937 to 1939. He also received Bharat Ratna in the year 1957. He was in coma for many days and he took his last breath on 7th March 1961. We lost a great leader, who abolished the Zamindari system and also struggled for making Hindi the official language of the country. He was a true Gandhian and followed the footsteps of Mahatma Gandhi. The family of Pants belong to Maharashtra but they lived amidst the hills. He was born in a Brahman family and finished his matriculation exam from Samay College in Almora. He then got a scholarship and went to Allahabad to join Muir College. After listening to Gokhale’s speech, he decided that he wants to dedicate his life to fighting for freedom. He decided to study Law. He belonged to an orthodox family but his views were progressive and modern. He did not believe in depriving people in the name of religion or financial status. He promoted Western education and believed that people should have the power to use their rights. Govind Ballabh Pant was an excellent orator and he moved the audience with his impressive speeches. He was a great man and he will never be forgotten. Many hospitals and educational institutions carry his name. His name will never leave our minds! He will remain in our history books and his stories will inspire the youth to stand up for the country and for their rights!